Hair loss and Kimkins - The Blog of Michael R. Eades, M.D. If you spend any time roaming around low-carb websites you will have stumbled upon posts about the now infamous Kimkins Diet. I haven’t made an in depth investigation into the situation, but from my brief readings it appears that an unscrupulous woman has been outed. Since the Woman’s World article the Kimkins empire has begun to crumble. Many of the top poster children for Kimkins have seen the light and have turned apostate on their former guru. Kimmer, the sort of namesake of the Kimkins plan, has been revealed by a private detective to be one Heidi Kimberly Diaz, who, far from the svelte petite woman she represented herself as being, is definitely obese. A Los Angeles television news show has done a multi-part series on the Kimkins Diet, and now it looks like there will be a class action suit filed against the program and its promoter as well (if it hasn’t been filed already). I’m not writing here today to add further to the Kimkins story or to pile on this poor woman. I’m writing to provide reassuring information to a whole lot of Kimkins followers who are in distress. Based on my admittedly cursory trawling through a number of bulletin boards and in reading the comments on some of the sites I linked to above it became clear to me that many people who have followed the Kimkins Diet have had major hair loss. Let me tell you what has happened. You are experiencing a common problem called telogen effluvium, which is the medical term for acute hair loss due to a metabolic, hormonal or drug stress. So you can better understand what has happened, let’s take a look at the normal hair growth cycle. Hair has a growth phase call anagen and a resting or dormant phase called telogen. Typically for hair on the head, anagen lasts around three years followed by telogen that lasts about three months. During anagen, the growth phase, the hair follicle is active and the hair grows; during telogen the hair follicle becomes dormant and the hair quits growing. But the hair stays in the hair follicle, and since you can’t really measure the growth of a single hair, you don’t know that the hair is actually dead and the follicle dormant. When the follicle reactivates during anagen, the new hair growing in pushes the old, dead hair out, and the hair falls from the scalp. That’s why we all find hairs on our pillows, in the shower, and other places it’s noticeable. Those old are hairs pushed out by the new hair growing in. This waxing and waning of anagen and telogen is why we continuously lose hair and yet our head of hair doesn’t continuously thin. And, I suppose, it goes without saying that not all of our hair is in lock step in this cycle otherwise we would have hair for 2-3 years, then it would all fall out at once. The estimate is that about 10% of hair on the head is in telogen at any given time, which means that the other 90% is growing normally. And even the 10% in telogen appears normal if you looked at an individual hair. It’s just not growing and will ultimately be pushed out when the follicle converts to anagen. But sometimes this cycle can be disrupted. A number of stresses can send hairs from anagen to telogen before their time. Pregnancy, a major illness, a high fever, an injury, surgery (usually from the anesthesia), some medications and a major change in diet, especially going on a starvation diet. The Kimkins Diet is nothing if not a starvation diet. It is a very-low-calorie diet, containing from 400-700 kcal per day. You saw the photos I posted of the subjects on the famous Keys’ 1600 kcal per day semi-starvation diet back in the 40s, so you can imagine what the Kimkins diet would do were you on it for a substantial amount of time. You would probably look like one of the women I posted on yesterday. So, for those of you who went on Kimkins and suffered a major hair loss, here’s what happened. The nutritional stress from semi-starvation nature of the diet shocked your hair from anagen into telogen prematurely. You didn’t even notice it when it happened because you lost no hair. Months later when your follicles again went into anagen and became active, the new hair growing in began to push the old hair out. And because the nutritional stress sent much more than your normal ongoing 10% into telogen, you seemed to lose hair by handfuls. Many people probably started losing their hair as they went off Kimkins and back to a more normal diet. At that time the hair follicles said (assuming hair follicles could speak): hey, stress is over; let’s start growing again. And they did start growing, pushing out the old dead hair. So, the take home message is that if you lost a lot of hair during your time on Kimkins (or any other diet), don’t sweat it. It will come back. If it doesn’t, then you’ve got something more going on than telogen effluvium, and you need to pay a visit to your doctor. But usually if you look closely at your scalp (or have someone look for you), you’ll see little hairs growing back in. If you’re a female and have long hair, it will take a long time for your hair to grow back to its full length, but it will. Is their anything you can do to hurry it along? Just make sure you get plenty of good quality protein and essential fats. And don’t worry about it. I hope this helps a few of you rest a little easier. Does that mean hair is not capable of growing any longer than what it would in 3 years? It means hair is not capable of growing beyond one’s period of anagen. Some people have a longer anagen than 3 years. I am a member of one of the boards this “poor woman” frequented. I’m not sure what her motivation was in the beginning – she was a member of that board for some time, maybe she had in mind all along to start her own “pay for admission” website – but she used to absolutely belittle anyone trying to follow a legitimate plan such as Atkins or Protein Power, chiding them for eating anything besides lean meat and diet Coke. She has defrauded and deluded many poor little lambs and she is now getting her just rewards. I feel for all the people who trusted and believed in her, and I hope that the ill effects they may have suffered by following her “diet plan” can be reversed. It’s so sweet of you to give them a ray of hope! I would imagine that most of the ill effects can be reversed with switching to a good quality, whole food low-carb diet. People survived the concentration camps in WWII and lived (some are still living) long lives. The human body’s ability to heal itself is amazing. Hang in there. You hair should be back to its old self before you know it. Don’t beat yourself up over it. Who do you know that doesn’t have ridiculous lapses of judgment from time to time. Please resubmit. I’m eager to hear your story. My spam blocking system must have eaten part of your comment. I noticed that after a few months of high-calorie low-carb eating my hair started to fall out and got noticeably thinner. A recent physical revealed a clean bill of health. Maybe “any” sudden, radical dietary change, even one for the better, can bring on telogen effluvium. Is that so? Yes, a drastic change in diet can cause the problem. But I would be willing to bet that even though you described your low-carb diet as being “high-calorie” that it was actually lower in calories than what you were eating before. Interesting … PP must have increased my period of anagen or the growth rate. In my first 50 years my hair never grew to more than 28, but after 2 years on 100g/day of protein it grew to 36″ for the first time. I was a vegetarian for several years where I always made sure I had the USDA levels of protein, but that was obviously not enough as my nails were always delaminating too. Since hair and nails are protein structures, it makes sense that they would do better on a diet higher in protein. Glad to hear you’ve done so well. I’m so glad you posted this. I’ve been doing Atkins for seven months now, and suddenly my hair is falling out! My friends say it’s malnutrition, but I CAN’T believe it is. I’ve been eating more protein and fat than I ever have in my life to date. I average 1800-2000 calories a day. My rate of loss has been slow and steady (1 – 1.5 pounds a week), and most of my carbs (I’m up to 40 now) come from veggies. This can’t be malnutrition — and I guess it’s not! I suspect that the reduction in calories from whatever you were eating before to the 1800-2000 you’re eating now caused the problem. But the fact that your hair is now falling out means that the problem is over and new hair is growing in. I lost 101.5 lbs over a 23 month period sticking fairly close to Atkins except for the occasional diet chocolate or atkins bar. I definitely did not do a kimkins type approach. Still I too experienced a hair dump to the point that I had a bare spot on my scalp and alot of hair coming out in the brush. I wonder if the rapid weight loss at the beginning might be interpretted by the body as like a pregnancy ending. The same thing happened to a friend each time she gave birth she lost a bunch of weight quickly from breastfeeding and turned into the receding hairline girl. It’s not just the Kimkins diet; it can be any abrupt nutritional change. Or pregnancy or surgery or medications or a major illness or any of the other events I mentioned in the post. I wrote it about Kimkins because so many people who had done that diet were agonizing over their hair loss, and I wanted to let them know they didn’t have to worry. This happened to me. I was on a 900 calorie a day diet, low carb, for 4 months. I lost 20 lbs, down to 136 lbs. About 1/3 of the hair on my head fell out! Good thing I have a lot….It didn’t actually bother me that much cause it took less time to blow dry. That was a year ago. It’s now grown back about 4 inches. My hair is several inches below shoulder length, so I’m guessing it’ll be even in another two years. Thanks for the explanation. My only problem now is, I am NOT losing weight on a low carb, reasonable intake diet (1500 average calories). (I gained all the weight back that I lost last year). I am tempted to go low cal again for shorter periods to lose these last 15 lbs, but after the hair loss, hormonal disturbances, anxiety, and depression I experienced I’m scared. Is there any hope for me?? I’m turning 50 soon, I’m 5’6 1/2″, and weigh 154. Hang in there with your low-carb diet. Sooner or later you will start seeing weight loss on the scales. What typically happens to people who go on very-low-calorie diets such as the one you described is that they lose a lot of muscle mass. When they regain their weight, they don’t regain the muscle, they regain fat. So they are fatter than they were when they started and with less underlying muscle. When these folks go back on a low-carb diet loaded with good quality protein they start to rebuild their lost muscle mass for a while. They are losing fat, but gaining muscle. If they lose 2 or 3 pounds of fat in a week, but gain 2 or 3 pounds of lean body mass at the same time, the scale shows no change. But since a pound of muscle occupies much less space than a pound of fat, even though the weight hasn’t changed, the size usually has. This stuff about rapid weight loss made me think of something I have long wondered about. How did De Niro quickly gain ( then lose) the 60 lbs he needed to, to shoot the older Jake LaMotta scenes in Raging Bull? Has anyever ever written about that? Could be instructive. Also, I think Vincent D’Onofrio gained 70 lbs! for Full Metal Jacket. If they both did it by carb loading ( how else? ), then, what should THAT tell everyone . . . ? I haven’t seen either of the movies you mentioned, and I don’t have a clue how the actors gained the weight. If anyone out there does, let us know. It would be instructive to say the least. What I would like to know is how Tom Hanks went from slightly blubbery in the beginning of Cast Away to the lean machine he was after 4 years on the island! I don’t want to know how people GAINED WEIGHT. I already know how to do that–I’m good at it! I want to know how they LOST it and got so chiseled! I’m not really into the Hollywood scene, so I don’t really have the answers to your questions as to how various stars lost or gained weight. Maybe others can help. The reason I think it would good to track down the Hollywood scene info, is that, like most folks, when the chips are down ( or the $$-meter is running ), the BS is dropped, and what actually works, is used. For example, most affirmative action advocates take a different viewpoint when we are talking about the pilot of their plane, or their surgeon. Likewise, even a Hollywood PETA or vegan spokesperson might take a different view to get or keep a part. So, I wonder what they actually did? Though I think we can guess. And I’m pretty sure our guesses would be fairly close to the mark. If anyone knows, John and I are all ears. I don’t take a different view about the pilot of my plane or my surgeon, because the pool from which applicants for these jobs are chosen is a group of people already qualified for the work. No one is advocating that we take a black man out of an auto factory and put him into an operating theater or an airplane cockpit. And shame on you for this racist statement, and on Dr. Eades for not calling you out. His being from Arkansas is no excuse. He’s an intelligent man. I know you wrote this in 2007 and you probably won’t even know I replied but dammit, welcome to the 21st century already. My feelings exactly! What a horrible, offensive analogy. Implying non-whites are inherently less qualified for highly-trained positions AND suggesting that no one with opinions different from his really takes their views seriously enough to stick to them WHILE also straying so far off topic, AND assuming white skin is a measure of security and a qualifier. What a mess. Who’s next–women and old people? Funny how a post in a weight loss forum reminds me some of my high school teachers who assumed all the black kids had parents who weren’t educated and didn’t work “real jobs”–despite all my AP classes being largely diverse and our valedictorian being Brazilian. And to use your example, John, I don’t see how scrutinizing the ethnicity of a pilot or surgeon–two occupations no one can do for themselves–is comparable to “what actually works” (part of your reason for the analogy). Trusting you’re in capable hands in life or death situations is one thing; assuming you are not because the person responsible is not white is another thing entirely. Assuming celebrities with single digit BF are lying when they say they lost 50 pounds in two months with “portion control” or “meditation” justly merits calling out the BS; imposing upon us your own insecurities about trusting that non-white people are equally skilled is unnecessary and irrelevant to this thread. As for vegans “taking a different view to get a part”–you haven’t ever spoken to any vegans–have you? It shows. I am a former vegan and can attest to the fact that most do not take their commitments (yes, that’s what they are) so lightly. Had you elaborated on your thoughts concerning how veganism may or may not compare to PP and ketogenic diets in effectiveness for health and weight loss, your off-color, off-topic musings may have had more substance. Like Dana, I also realize this is from 2007. But your post was so… strange and left-field I couldn’t shake the nagging “WTF” feeling I had after reading it. I was going to ignore this when Dana wrote about it but since you’re piling on as well, I’ll go ahead and lay out my own thoughts. It seems to me that the two of you are the ones exhibiting racist tendencies by your notions that black people are the only ones represented by affirmative action. All protected minorities are covered by affirmative action, and that includes white women, Hispanics and any other group the government lists as ‘protected.’ So it’s not just black people. Assuming that black people are the only ones involved when someone mentions affirmative action – IMHO – shows the same kind of subtle racism Bill O’Reilly shows when he says of a black guest on his show, “You’re an articulate guy – we’ll have you back on again.” Have you ever heard him say that about a white person? The answer is No. He is obviously surprised and pleased when he interacts with articulate black people, and in complimenting them on their articulateness, reveals his own subtle racism. I hate the whole notion of affirmative action because I believe that we should operate in a meritocracy and not a quota system. The NFL (or any professional sports organization) is a meritocracy. It doesn’t matter what your race is; what matters is how well you can play the game. Imagine the outrage if some governmental body insisted that the makeup of the rosters of the NFL or the NBA or major league baseball had to represent the makeup of the population of the US. It would be ridiculous, and rightly so. I feel the same way about affirmative action. And so does my wife, who is considered a ‘protected’ minority by the US government. She had a 3.96 GPA in college, got accepted into med school (which is extremely competitive) in her junior year of college (very few make this cut) and excelled in medical school. And she is annoyed because some people still feel she got where she got because she was a woman and thus received special treatment. The quota system ends up putting some people in positions in which they have no business being and demeans those who got there by their own grit, determination and ability. In my opinion, not being a supporter of such a system does not make one a racist. It does make one a meritocratist, I suppose (if there is such a word), so I’ll cop to that. I remember reading that DeNiro ate lots of pasta (surprise, surprise!) to pork up for Raging Bull. Also read an interview with Brad Pitt where he stated he ate a high protien, low carb diet to get in shape for Troy. Gary didn’t say that people can’t lose weight by exercising; he simply said that the medical literature doesn’t show that it’s particularly effective. I’m sure (and Gary is sure) that there are many people out there who have started intense exercise programs and lost a lot of weight as a consequence. But when uncommitted subjects are randomized into an exercise group in a study, they don’t lose any more weight than those who don’t exercise. Which makes the doctors recommendation to exercise a little to help lose weight a not particularly helpful recommendation. About the exercise, I had forgotten that my sister lost 90 lbs on protein power without changing her daily routine. I had thought at the time that there was something special about her metabolism as opposed to any other human, but now I know that it’s the hormonal changes brought about by the reduction of insulin that let her release body fat. At the time she had a desk job where she would occasionally get up to distribute paperwork, and would go home to take care of her husband and son, but she wasn’t taking even the occasional walk. I know because she told me she tried walking around her neighborhood and found it too boring so she quit! It took eighteen months, but so what, at the end, she lost 90 lbs! Thanks, Dr. Mike. That was so reassuring. Dr. Mike, I commented on here before, but out of curiosity, how long does the period of hair loss generally last? It’s probably not a bad sign. Remember, all the hair doesn’t go dormant at once. And when it comes in it pushes the old dead hair out. So when you see your hair coming out there should be new hair coming in below. This is one of the key players in the fight against Kimkins and I think you should read her blog…don’t foget to search the webring too and see the other great info about this SCAM! I’m moving into my eighth month of LC and my **ninth week** of hair coming out in clots in the shower… it’s baffling to me as I’ve upped my calories to ~2200 average, and my carbs to around 60g a day, and am successfully maintaining and feeling great. But I wonder if the continued hair loss isn’t a bad sign. I suspect that the new hair is coming in and pushing the old, dead hair out. But I have no way of knowing this without examining you. If you are concerned, you should see a dermatologist. Not without knowing a lot more information. One shouldn’t lose hair as a teenager, unless, of course, one has been on a calorically-restricted diet. Wow, I hope this comment section is still active. I went on a starvation diet for four months and lost forty plus pounds. About a month and a half ago I noticed that my hair would come out in clumps when I ran my hands through my hair and that my scalp became very sensitive. I saw my doc and she said it was…whatever that long name is for it what you described in the article lol…I’m taking 3000mg of biotin, multi vitamin, iron pills, vitamin e pills, fish oil tablets, flaxseed oil tablets, and vitamin c pills…….are these all good to help my hair to grow again? And how much longer must I wait until my hair is thick again? The supplements you’re taking sound fine, but I don’t know that they’ll help your hair situation. I’m sure that you’ve probably got new hair growing in pushing the old out. That’s what usually happens. If that’s the case, your hair should be back to normal as soon as the new hair grows out. Hair grows at the rate of about an inch per month. If you’re concerned, you should probably see a dermatologist. So I went on a dieting plan … I just managed to survice on 2 bread slices for breakfast and 1 for dinner… Lunch – 3 days a week – 1 bowl of white rice with some curd…I did that for 4 months and yes, I did loose some 26 pounds and the flab reduced visibly… But after 6 months or so… I became BALD!!!! I have a family history of baldness (my dad and grandfather are bald, but my mom and her brothers have good hairs)… Also, my hairs are quite normal at the back and the sides.. It is only in the front and on top that the loss is visible… Does dieting interfere with the onset of natural balding (Male pattern baldness) ? Can this be reversed if I resort to moderate workout with a 2000-2500 calorie diet ??? Baldness resides on the X chromosome, which means that it comes from the mother’s side, not the father’s. So the fact that your father and grandfather are bald has no impact on your own chances of balding. As I pointed out in the article, if your hair is falling out as a consequence of an extreme low-calorie diet, it means that new hairs are growing in. If your hair doesn’t come back, there is likely some other cause that needs to be checked. As the post says, the hair loss occurs because new hair is growing in and pushing the old dead hair out. You should be fine. Thank you so much for this article. I stopped low carb dieting about 6 months ago, after losing 90 pounds. Two months after that my blood pressure shot up and i was put on medications. Shortly after I noticed my hair falling out, not in clumps, but definately a lot more. I can’t pin it to anything specific because i had stopped Atkins, started medication, and had an injury at work. 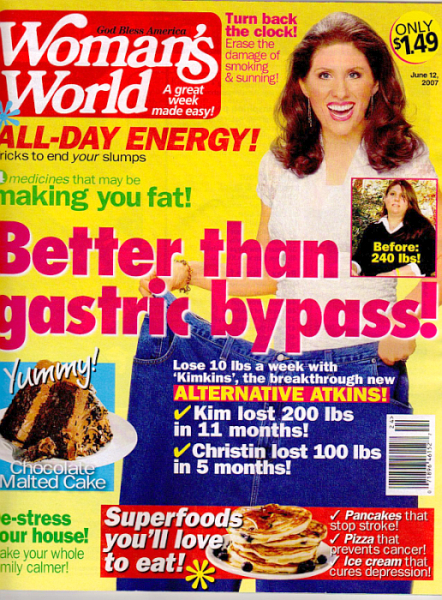 Two weeks ago I returned to Atkins, finally realizing that this is a life long change. I went to my doctor who gave me medication to try and stop the hair loss and have also started on a multi vitamin and calcium hoping my hair will return. Your article has given me hope that all may not be lost. If the hair loss occurred because of dietary changes, you should regrow your hair just fine. It seems I remember reading in one of your Protein Power books that some hair loss could be a consequence of starting the Protein Power diet, but that the hair would grow back and be healthier than before. I can’t put my finger on that paragraph now. I see your reassuring responses above. Am I correct regarding the hair being healthier upon its return while continuing a Protein Power style diet? I have been facing hair loss too since I was 16. I tried to consult many doctors and used many medicines but none of them worked.Then I came across this herbal shampoo named as Zulvera Shampoo (herbalhairshampoo.com). Within a few weeks, I could see a positive effect by using that shampoo and that shampoo really worked for me and made my hair grow again and also made them smooth. Thank you Dr. Eades! I knew you would have a reassuring word on the loss of hair. I am 56 and through menopause. I also am about seven and a-half months into PP, and have lost 41 pounds! Yeah! Some of my hair actually is beginning to grow back, but my concern is the thinness of the actual strands of my hair, they have become sooo thin. Because the new growth is still so short, I cannot tell if the strands are any thicker than the ones that have been falling out. Do you think that the new strands will be stronger than the ones falling out? I have been wondering if baldness in general, “male pattern baldness” is diet related. I don’t recall seeing pictures of people in Price’s book or native Americans with baldness. I recall a single observation from Price that he didn’t see any baldness in the populations eating traditional diets. Do you have an opinion on this? Since I don’t have a problem with baldness – if anything I have the opposite problem: too much hair that grows like crazy – I haven’t spent much time looking into it. My friend Loren Cordain, however, has spent a fair amount of time studying baldness, and, based on his research, he believes apical baldness (baldness on the point of the head) is a function of insulin resistance. Just FYI, telogen effluvium hair loss can occur independently of new regrowth. I have heard of people who start losing their hair after they started eating well, and I have also heard of people (including myself) who begin losing hairly fairly soon after losing weight while their diet is still poor. My hair began falling out about 2 1/2 months after I stopped eating well due to personal problems. I was already a thin person, and I lost 25 lbs. very quickly. I was probably undereating for a period of about 5 months. I finally went to the doctor two months ago and started eating better. My hair is still falling out more than it should and according to my doctor I have some regrowth but not enough to indicate TE recovery. I just thought you should know that not everyone sheds hair only when they can afford to regrowth. For many, if you haven’t removed the trigger for the hair loss (poor diet) the hair loss will continue and new hair will not grow in until you are taking in sufficient calories for a period of time. I have this problem too. Hair is falling out after starting on low carb (6 months now–40 pounds down). NO NEW HAIR GROWTH! Doc says thyroid is fine and shrugs her shoulders. My hair started falling out over a year ago. I was not on any kind of paleo diet then. Last September I started up on Oral Contraceptives (Ortho Cylen) because it was listed as one of the ones having the least androgenic effects. Eventually I started to see a little bit of hair re-growth and I think it slowed down. I switched over to the nuva-ring because I was spotting constantly and that dropped me into a deep depression and moodiness. My hair started falling out again, though I also think that may have been stress induced. Around April I went paleo. I eat lots of saturated fats, meat and veggies. I’m reducing my fuit intake, and add nuts in occasionally. I may have been drinking too much, so I’m cutting that out, but I’m really frustrated. I went back on Ortho Cyclen and even though I’ve had some new regrowth, I still have very sparse hair on the front and center of my head. I’m 35 and my family does have a history of early menopause, so I though that was it, hence the OC. Ortho Cyclen is 35mcg of estradiol, For about a month I upped my dosage to about 50mcg and that’s when I think the hair re-growth really took off. But still.. sketchy patches, hair everywhere… it’s depressing. Help! thanks for all this information. It is good to know it isn’t just me. I thought I was dieing. I too, lost 40 pounds on Atkins over a 7 month period. I look great, feel great and have amazing energy.I have been religiously taking mulitvitamins, fish oil, biotin and potassium. Only in the last two months have i seen my hair falling out majorly. I was terrified and considered pigging out again. I am a very vain person and love my long blond hair. My hairdresser assured me that he could see evidence of new hair growth (short little fluffs…) yet, my shower drain clogs every shower and I FEEL like I look bald as a result. My calorie count is ok…i have begun adding fruits to my diet …just no processed foods, no breads, no pasta, no rice…plenty of veggies, fish, meat (white and red). nuts and water. It is funny….the body is happy but the scalp/hair is not. I will be patient and await more hair growth. Thank you so much – all of you, for sharing your stories. I do NOT want to be obese every again…yet I do love my locks! I wonder if some of the having good hair when you’re fat thing comes from fat and estrogen being in a sort of feedback loop. Doesn’t higher estrogen lead to more hair growth? I can’t remember. But I can certainly see where not getting enough protein would be a problem, hair being pretty much nothing *but* protein. My have long dark hair & it always used to be very glossy, soft & smooth – people always commented on it. I went Paleo (well, mostly) as well as working out a lot, and lost 18kgs in 2010 prior to my wedding. I did not have any noticable hair loss at all – but I did notice that my hair wasn’t as nice & shiny/healthy-looking as it had previously been. My hairdresser said that, whilst protein is good for healthy hair, a diet that is extremely high in protein can actually dry the hair out a bit & have the opposite effect. That seemed a reasonable explanation to me. Any thoguhts? Ooops, I meant to say I have long dark hair, not my.